When it comes to reports of climate change, I cannot escape “fake news,” which I define as wholly made up with little basis in fact. More often than not, however, what I observe are news stories in which the reporters exaggerate or simply misunderstand the results of scientific studies. In a confusing landscape of climate news, it is not easy to know what to believe. That’s why we need news reporters who work hard to get things right by understanding the science and conveying information in a meaningful way. Key to the effort is figuring out which studies are even worthy of mention. A huge red flag for me is when I read a report from a so-called scientist who gathers no original data of his or her own, but instead grabs information from someone else’s peer-reviewed report and totally changes the conclusions of the original author. “Climate Feedback,” a website in which climate scientists review the accuracy and tone of news stories, can help us understand the complexities of climate and identify reporters who tend to get things right. One drawback of the website is its focus on a national audience, which leaves out stories by numerous reporters working at mid-sized and smaller newspapers and magazines. Still, I was delighted to see a new article on the website that looked at the top 25 climate stories that went viral during 2017. Many of these stories were new to me, and the analysis helped me to get a feeling for the inflammatory and untrue nature of some stories floating around the Internet. Out of the 25 stories most viewed and commented upon, climate scientists considered only about half of them to be highly credible, containing no major errors or misleading descriptions. 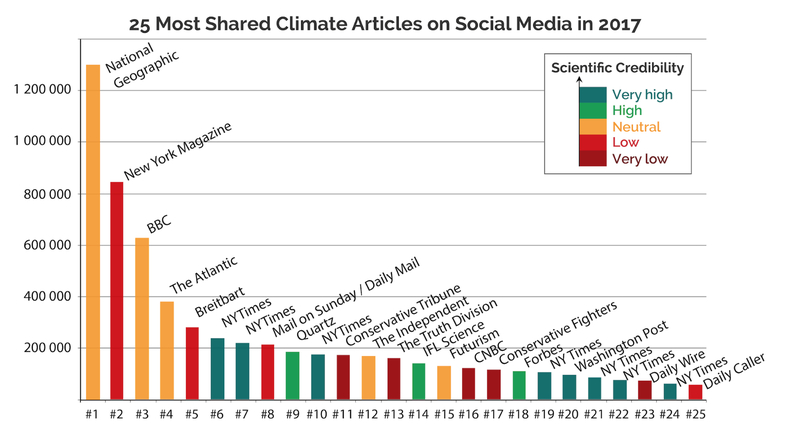 Because of its widespread readership, seven of the most-read articles were from the New York Times, which was rated highly for scientific accuracy. Of the top five articles getting the most public attention, all contained some credibility problems. Among them, an article in New York Magazine titled “The Uninhabitable Earth,” was found to be overly sensational by Climate Feedback reviewers. Author David Wallace-Wells intentionally looked for the most extreme conditions imaginable under climate change scenarios, though he accurately described several scientific studies. After the criticism, Wallace-Wells followed up with detailed notes in annotated format to support his approach. The remaining three of the top five stories — from National Geographic, BBC and The Atlantic — were described as “neutral” with only a few problematic issues. The main criticism of the National Geographic story, which described the effects of climate change on polar bears, was the apparent suggestion that a specific polar bear (shown in a photograph) was starving because of climate change, whereas nobody knows what had happened to that particular bear. While on the topic of scientific information, I’d like to again share a source to which I am somewhat addicted. Science Daily is really nothing more than a collection of news releases from universities and other institutions where research is being conducted. These news items, usually approved by the researchers themselves, are written for nonscientists. They are often the first glimpse that we can get into new findings. As such, one must be cautious, because new findings do not always pan out. The website links directly to the original scientific papers and news sources, and it sorts by topic, such as “Climate News.” One can also sign up for email notifications.